Home to Africa’s greatest horseracing event, the Durban July, Greyville Racecourse hosts a total of 12 Grade One races during Champions Season which offers more than R44 million in race stakes. 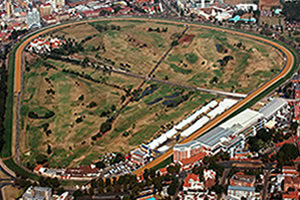 Framed in the background by the many hotels of Durban’s Golden Mile, Greyville Racecourse is situated at the bottom of Durban’s Berea and surrounds the green expanse of Royal Durban Golf Club’s championship course. an uphill section from the 2 200 metre mark up to the 1 800 metre mark. thereafter a gentle downward slope to about the 1200 metre mark. an uphill section follows from the 1000 metre mark into the straight. an almost level 450 metre final straight to Greyville’s famed winning post. On 11 June 2014 Greyville raced for the first time on its new Polytrack. Positioned inside the turf track the 2000 metre Polytrack, which accommodates a maximum field size of twelve, has proved very popular. Polytrack racing takes place every Friday night from September to April. Say the suburb name ‘Greyville’ to the average Durbanite, and you will discover it is virtually synonymous with the Durban July and Durban’s first and longest running sports venue – the Greyville Racecourse. The Durban July is comparable to Britain’s Royal Ascot – high fashion, exciting horse racing, food, champagne and a lot of people. And you don’t even have to know all that much about horse racing to enjoy the festivities. The race was first held in July 1897 with only seven horses and today it is one of the highlights of the horse racing calendar. Ladies and gents alike come out arrayed in the most incredible designer outfits – most of which are designed for visual appeal rather than practicality. Large hats and vibrant colors are the order of the day and once the race is over, most supporters head out to one of many after parties until the early morning hours. The Durban July – currently sponsored by Vodacom – is the most talked about and attended horse racing gathering among South African horse racing fans. With over R1.5 million at stake, the Durban July – held at the Greyville Racecourse – is the one horse race everyone takes note of. The race takes place over 2.2 km and is the main event on a packed card, the last four races of which are run under floodlights. The race card also includes the 1.6km Garden Province Stakes, the 3km Gold Vase, the 1.4km Golden Horseshoe and the 1.4km Golden Slipper.